We fabricate our partial removables from only quality materials, regardless if you prescribe our standard product, or upgrade to premium materials. There are numerous options available to suit the needs of our customers, be it a cast metal partial, flexible partial, cast partial utilizing flexible, injected clasps, or a hybrid/combination partial which utilizes the best of both the cast metal partial and the flexible, metal free partial. In regards to the flexible partials, we offer numerous brand options, in the event you prefer one brand over another. Our extensive knowledge and experience allow us to tackle the most difficult and complex cases. 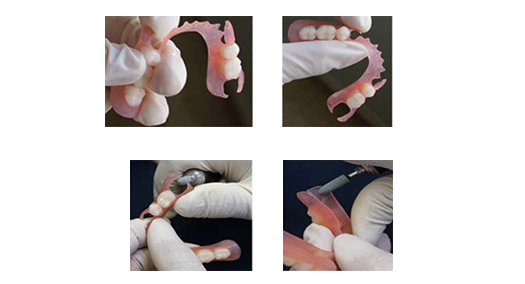 Our partial removables can be made with clasps or in conjunction with attachments (to allow for a claspless partial). For more information regarding attachments for partials, please see the Attachments for Fixed & Removable Cases page of our site. After we survey the case, we will design it as ideal, or we will follow your specifications and requirements, whichever you have indicated to us. Premium alloys are utilized to manufacture our frameworks. The casting alloys we use are free of nickel and beryllium. They do not include any questionable elements such as indium or gallium. The alloys are biocompatible, homogenous in structure, and easily tolerated by the tissue. The resulting frames are fracture resistant, with a pleasing silver finish. In addition, they are light weight and super spring hard. The high modulus of elasticity enables a detailed, strong, and fracture resistant framework with proper fit and durability every time. We offer both our standard and Vitallium® 2000 alloys. Processing can be completed in our standard material or Lucitone 199. For patients that require a cast partial but do not desire metal clasps on the anterior, please see the Hybrid Cast/Flexible Partials and Injected Flexible Clasps pages of our site to learn about the available options. We can design the frame accordingly and process the partial with the option that best suits the needs and desires of the patient. Our standard CrCo alloy is of only top quality. It is nickel, beryllium, iron, indium, and gallium free, with a Vicker’s Hardness of 370 and a tensile strength of 960 MPa. The composition is 63.3% Co, 30% Cr, 5% Mo, 1% Si and less than 1% Mn, C, W, and N. The frameworks produced are fracture resistant due to the excellent physical properties, and the high modulus of elasticity allows for delicate, yet rigid design and construction. The reduced surface hardness allows for easier adjustment and polishing. You’ll be extremely satisfied with the properties of our standard cast partial alloy. Processing can be completed in our standard material or Lucitone 199. For patients that require a cast partial but do not desire metal clasps on the anterior, please see the Hybrid Cast/Flexible Partials”and Injected Flexible Clasps pages of our site to learn about the available options. We can design the frame accordingly and process the partial with the option that best suits the needs and desires of the patient. For our customers with a preference for Dentsply’s Vitallium 2000 alloy, we are happy to provide its availability to you. Vitallium 2000 has been the undisputed premium CrCo partial denture alloy since it was introduced in 1997. Vitallium® 2000´s tensile strength of 855 MPa’s makes it extremely fracture resistant and with an elongation of 9%, the partials adjust like gold. If you have never previously prescribed Vitallium 2000, give it a try on your next premium partial removable case. Prescribe a metal-free partial when the patient desires a removable solution without metal clasps or metal on the tissue surface. We have three brands of flexible partial material available: Valplast®, tcs®, and Lucitone FRS®. These are tissue borne partials and do not utilize occlusal rests. When the stability of a cast partial is required, but the patient demands the esthetics of a flexible partial, you can turn to a hybrid cast/flexible partial. All three brands above are compatible with a cast substructure and we design them to ensure no metal shows on the facial/buccal surface, with the exception of posterior clasps, when required due to constraints. We also offer a tooth color polymer framework material, Ultaire AKP, when a framework is desired, but metal is not. Like cast partials, both the hybrid partials and Ultaire AKP partials are tooth borne. Valplast is a flexible denture base resin that is ideal for partial dentures. The resin is a biocompatible nylon thermoplastic with unique physical and esthetic properties. Valplast allows your patient’s natural tissue tone to appear through the material, matching the basic shade categories (standard pink, light pink and meharry). 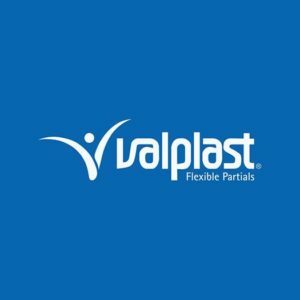 Valplast provides a fully functional and esthetically superior removable partial. Practically invisible, Valplast is ideal for cases when your patient desires an esthetically pleasing, lightweight restoration. In addition, Valplast may be used whenever the patient is considering a removable partial denture. The material can be used for all partials, unilateral removable replacements, and one tooth flippers. When a Valplast partial requires a reline, it is usually jumped to a new base (rebase). To have us add a tooth, reline, or rebase the partial, please follow the following steps. A wash impression is taken inside the partial using light body PVS material. Be sure to use a light coating of adhesive inside the partial. When the wash impression is made, the patient closes his/her mouth gently to ensure the partial if fully seated and the occlusion is accurate, as the PVS material is setting. Once the PVS material has set, an impression is taken inside a tray and the impression is removed from the mouth with the partial and the wash material reline in place. Carefully examine the partial to assure that it is positioned correctly and did not unseat when the pick up impression was made. Send the pick up impression with wash reline inside the partial to us for rebase or reline. If you use alginate material for the pick up impression of the partial and PVS wash/reline impression, then you must pour the impression before sending it to us. The tcs® Unbreakable RPDs are thin, flexible, lightweight, and extremely comfortable. Doctors and patients enjoy the unparalleled simplicity, comfort and aesthetics. Today, more and more dental practitioners are relying on nylon-based removable partial dentures for their patients. Acrylic denture bases are hard and they can break. In addition, partials that contain metal clasps can be unsightly, causing many patients to feel self-conscious about the way they look. Partials utilizing cast clasps are becoming increasingly undesirable to patients who want to limit the amount of metal in their mouth. Valplast® resin is engineered to provide exactly the right degree of strength and flexibility inside a patients mouth. In order to facilitate a smooth first insertion of the denture, it is best to simulate the conditions of the oral environment by bringing the Valplast® denture up to body temperature. This may be done by immersing the denture in hot tap water for a period of 30-60 seconds before inserting it into the patient’s mouth. This will give the material the same flexural modulus that it would have at body temperature and will enable the patient to adapt to their new prosthesis faster and easier. This procedure will also provide you with important information regarding the fit and comfort of the denture in the event that it may need minor adjustments. Because material thickness and the design of a clasp play an important role in providing retention and stability to a Valplast® Flexible Partial Denture, it is important to exercise caution when adjusting a Valplast® clasp. In many cases, it may not be necessary to adjust the thickness or gingival extension of a Valplast® clasp as this could change the flexibility of the material. If a clasp fits too tight in the patient’s mouth it is recommended to place the clasp in hot water for 60 seconds then bend the clasp outwards and allow it to cool down gradually to relax the elastic memory of the material. If a clasp is too loose you may use the same technique, bending the clasp inwards to tighten it. In some cases, it may be necessary to provide minor relief to the denture in order to provide a better fit and increased comfort for the patient. This may be done by using the Valplast® #13 Green Stone on a slow speed handpiece to relieve the denture surfaces and borders. A constant motion of the bur over the material contact surface will yield a very smooth surface that usually does not require repolishing. Top 100 product for 2014. As chosen by the readers of Dentistry Today, our tcs® partial has been selected as a Top 100 product for 2014. Why choose a tcs® partial? tcs® Unbreakable material is manufactured in the U.S.A. from the highest quality materials. Unbreakable: Replacing or repairing broken partials is expensive and inconvenient. Patients have to be without their partials while they’re waiting for them to be repaired. A tcs® partial won’t break if it is dropped or mishandled. Please remember, however, that the resin teeth are still breakable. Lightweight and Comfortable: Patients get used to them quickly and soon forget they’re wearing them! Aesthetic: tcs® Unbreakable blends naturally with the surrounding tissue and gums. In fact, they’re practically invisible. Younger patients will appreciate the natural look of tcs® Unbreakable. Our strict quality control means they don’t vary in shade, you can always count on consistent color. Biocompatible: tcs® Unbreakable RPDs are biocompatible, making them ideal for patients who are allergic to monomers. tcs® is available in four shades. From left to right in the photo of the shade guide: 1- light pink, 2-standard pink, 3- light/dark pink, 4- dark pink. The Hot Water Treatment is very important as it allows for a smooth initial insertion and a good adaptation with your patients natural tissues. Submerge the tcs® Unbreakable restoration in very hot tap water for approximately one minute. When the partials cools to a tolerable temperature, gently insert it into the patients mouth. If the patient senses discomfort due to tightness of the clasp, the clasp may be loosened slightly by submerging that part in hot water for approx 30 seconds, removing it and gently bending the clasp outward while holding it underneath running cold tap water. The clasp can also be tightened by following the same procedure but bending the clasp inward. If further adjustments are needed, they can be made easily with the proper tools and techniques. If patient feels persistent irritation, reduction of the partial may be necessary. There are a variety of burs that are specifically designed for thermoplastic materials. Specifically, the following carbide burs 50C25-01 50C79-01 50G79-01, 50251G-01 and the green mounted point 4501-01. These can be purchased directly from Thermoplastic Comfort Systems, Inc.
Set your handpiece on a low speed and use fast, light scraping back and forth movements to reduce area. Do not keep bur in one spot, be sure to keep it in constant motion. Do not use too much pressure as this may burn or distort the restoration. Rubber Wheels or Points are ideal for making small adjustments and/or smoothing after adjustments have been made. Usually the brown rubber wheel/point will leave the case smooth and shiny and it will not be necessary to re-polish. These are part numbers 4503-01, 4510-01 and 4511-01 and can also be purchased from Thermoplastic Comfort Systems, Inc.
Continue to brush your natural teeth and gums as directed by your dentist. Clean your restoration daily. Simply rinse your restoration under warm running water for approximately 30 seconds to one minute in order to remove any food particles prior to soaking it in the denture cleaner. With a very soft denture brush, brush your restoration using water only. Rinse again. Place your restoration in tcs® Concentrated Denture Cleaner for at least 30 minutes per day. Keep your restoration in water or tcs® Concentrated Denture Cleaner when you are not wearing it. DO NOT use bleach, toothpaste, or similar cleaning products, these may scratch or discolor the surface of your appliance. Please remember that although tcs® is unbreakable, the teeth are not. Please handle your partial with care. The cleaner can be purchased directly from the company by visiting https://tcsdentalinc.com/collections/frontpage/products/tcs-concentrated-dental-appliance-cleaner-tcs-dental-appliance-brush. When a tcs® partial requires a reline, it is usually jumped to a new base (rebase). To have us add a tooth, reline, or rebase the partial, please follow the following steps. Lucitone FRS, by Dentsply, is a thermoplastic injectable resin for use in creating flexible partials and small to medium sized dentures. It is a monomer free material and offers superior flexibility, transparency for optimal esthetics, and excellent stain resistance. The FRS material also resists stress fractures. Its microcrystalline structure is easy to polish, similar to that of acrylic. Restorations manufactured using FRS are very light weight and comfortable for the patient. Light pink, original, and clear shades are available. As chosen by the readers of Dentistry Today, our Lucitone FRS partial has been chosen as a Top 100 product each year from 2007 to 2013. FRS material cannot be relined. When relines are required, the case is rebased with new FRS material. When the stability of a cast partial is required, but the patient demands the esthetics of a flexible partial, prescribe a hybrid cast/flexible partial. These partials consist of a cast subframe made with either standard or Vitallium 2000 alloy and a flexible partial injected onto the subframe. Choose from Valplast, FRS, or TCS material for the flexible material which will make up the saddles and clasps of the partial. Any major connector design that would be used for a standard cast partial can be used for the hybrid cast/ flexible partials. On the maxillary arch, horseshoe, palatal strap, and A-P strap designs are all acceptable, depending upon the limitations presented by the case. On the mandibular arch, lingual plates and lingual bars are no problem. When retention presents a concern, we can keep the posterior teeth clasped with standard cast clasps, while maintaining the esthetics of the flexible material on the saddles and anterior teeth. Before you insert the partial into the mouth for a wash pick-up impression, inject a small amount of impression material around the buccal of the clasped teeth at the gingival and cervical area. This will ensure that the undercut areas are captured. While you want the saddle areas of a hybrid partial covered by the impression material, it is very important that the impression material does not flow over the major connector of the framework. If you remove the pick- up impression from the mouth and see the metal major connector or lingual plate covered by impression material, you must remove the partial and take a new pick-up impression. When patients desire a more esthetic option than the wire or cast clasps associated with interim and cast partials, consider the inclusion of flexible clasps. Flexible clasps can utilize even the most undesirable undercuts and blend with the existing dentition or tissue. They are available in three options; Thermoflex tooth colored, Valplast & TCS tissue colored, and Lucitone FRS clear. Thermoflex tooth color injected clasps are extremely flexible and can utilize even the most undesirable undercuts for added retention. Use Thermoflex tooth color injected clasps when the patient desires a metal-free, esthetic clasp that blends with the existing dentition. Because the clasps are available in 16 different colors, we are able to match most any shade. In addition, the material can be used to make an entire framework, if desired by the Doctor. We utilize the clear shade of Lucitone FRS, by Dentsply, for the fabrication of clear flexible clasps when a cast clasp or wire clasp is not desired, nor is a tissue shaded clasp desired. If the tissue shade is difficult to match, or the height of the tooth is not ideal for cervical coverage by a tissue color clasp, order a clear FRS clasp. The FRS material is a thermoplastic injectable resin for use in creating both flexible partials and small to medium sized dentures, in addition to clasps. It is a monomer free material and offers superior flexibility, transparency for optimal esthetics, and excellent stain resistance. Its microcrystalline structure is easy to polish, similar to that of acrylic. Sometimes you want the esthetics of tissue colored, flexible clasps but a partial made entirely of Valplast or TCS flexible material is not indicated for the case. When you require acrylic on the saddles (such as for an interim partial which will require relining) and wrought wire or cast clasps won’t meet the esthetic demands of the patient, order the partial with flexible clasps utilizing Valplast or TCS material. They are available in the same shades offered for the Valplast and TCS partials. Often called flippers, stayplates, or immediate partials, our interim partials are available with or without wrought wire clasps. Wrought wire clasps will be utilized by default, unless instructed otherwise. When clasps are required for retention, but the patient demands the best esthetics, we can incorporate Injected Flexible Clasps instead of wrought wire. Processing of the acrylic can be done using our standard acrylic, or premium Lucitone 199. Almost any design is available. Call or email us with inquiries. All teeth are available in your choice of 22K yellow gold, coin gold (looks like a new penny) and white gold. Early techniques and procedures required bending a piece of gold over a tooth shape mold, then sealing the joints with gold solder. These early teeth have sharp 45° edges where the flat lingual surface is joined to the mesial and distal sides. The new manufacturing process produces gold teeth that more closely match the shape of existing denture teeth with no seams. Gold onlays are available on any of the stock teeth. Choose mesial strip, distal strip, incisal strip or any combination.